Though a typical registry cleaning routine performed through these applications is quite safe, I'll still recommend creating a restore point to avoid any mishap. Remember, if you've not cleaned the registry for years, the entire process may take some time. So, if your registry cleaner continuously scans and cleans the registry for a few minutes, it's perfectly normal. 1. Auslogics Registry Cleaner - It is a completely free registry cleaner with no strings attached. Generally, for safety sake, users create a restore point before running a registry cleaning application. But, this application, automatically creates a restore point before starting the registry cleaning activity. It also enables you to review and exclude selective registry entries from the cleaning activity. The application itself is very popular with a large user base and also has a nice and user-friendly interface. 2. Wise Registry Cleaner - It's one of my favorite registry cleaning applications. Before starting the cleaning activity, it takes a backup of the registry to restore it easily in case of an emergency or a mishap. If required, users can also do a complete system or a registry backup—on a manual basis. One of its fantastic features is the scheduling option for automated registry cleaning at the regular intervals. Power users can run custom registry cleaning tasks to scan selective part or selective type of registry entries. 3. Glary Registry Repair - This is one of the fastest registry cleaning applications. It can scan a large registry database in a quick time. You can also whitelist registry entries to be excluded from the scan. Like other professional cleaners, this one too creates a registry backup before triggering the cleaning operation. This backup can be easily used to restore the registry to its previous state. It's one of the lightest registry cleaning applications which runs blazing fast on older systems too. 4. AVS Registry Cleaner - This multilingual registry cleaner works like charm on both 32-bit and 64-bit Windows systems. You can select or exclude certain registry entry categories for scanning. Manual backups of the registry can be created for added safety. 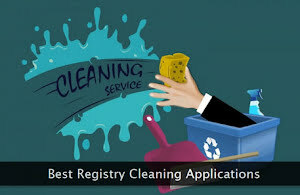 This application too has a scheduling option for the registry cleaning process. It can also be used to clean up junk files on your system. Automatic restore point creation can be enabled or disabled as per your preferences through the program settings. 5. Advanced SystemCare Free - This is an all-in-one system optimization application which includes a registry cleaner too. It has an excellent user interface even a layman can use with ease. It has received good reviews and ratings both from the users and from the popular technology websites. It uses advanced algorithms to safely delete the correct junk entries within the registry. This ensures that your PC never goes in an unstable state and works flawlessly without any hiccups. 6. Registry Life - This handy tool does both the cleaning and optimization of your Windows registry. It also has an important and powerful undo option to quickly rollback all the changes done to the registry. It's one of the best tools to both defrag and compress the Windows registry. Unnecessary information related registry entries can also be removed through this application. It's a lightweight application without any bells and whistles. While cleaning the registry, it displays the relevant information—simultaneously. 7. CCleaner - And, last but not the least, is this massively popular PC optimization tool which has a registry cleaning module too. I've personally used it for years in the past with impressive results and performance. Its registry cleaner is blazing fast and works flawlessly. It's frequently updated with new and improved features to keep up with the ever-changing functions of the Windows operating system. It also includes several easy-to-use tools to keep your Windows system in a healthy and optimized state.